Choose a stunning image daily or follow the guidebook to unblock your own inner muse and inner mentor team. Based on extensive research! 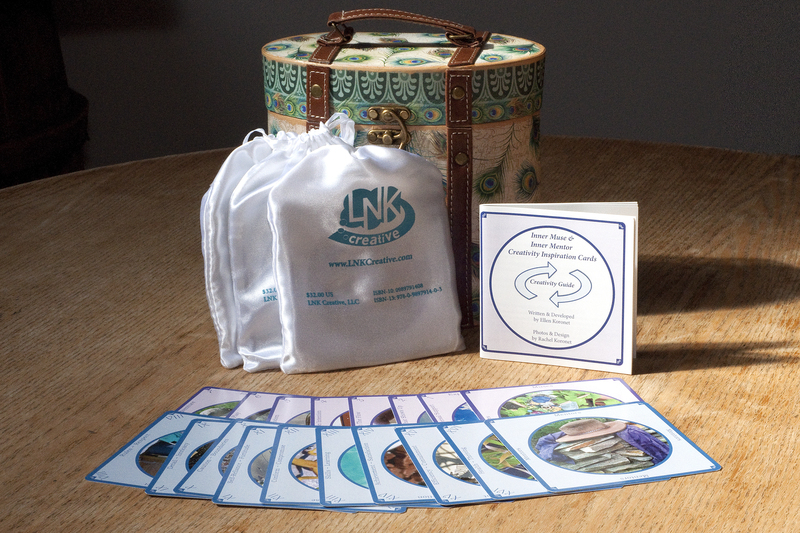 These cards have been tested and proven to be spark creativity, healing, and innovation. This archetypal picture deck contains sixteen “Inner Muses” and “Inner Mentors” that Ms. Koronet has observed and documented to be at play within individuals and brands. Ms. Koronet uncovered a deeply ingrained "polarity" dynamic through her research: These complementary pairs of qualities unlock enormous inspiration and provide next steps for any challenge. This is a deck of 16 double-sided picture cards (plus a master list of Muses and Mentors), each representing an Inner Muse or its “twin” Mentor. The Guidebook describes each quality and its upsides and downsides. Early in the process of conducting “Inner Muse Focus Groups,” Ellen K began to notice that archetypal qualities emerged. All of the first fifty or so participants described similar “Inner Muses.” When asked to focus on inner observers whose job it is to see ideas to fruition, these participants instantly rattled off objections and concerns. These questioning entities represent universal qualities that complement the Muses.